(MENAFN - Gulf Times) Iran and Iraq have reached an understanding about developing two oilfields on their mutual border, Iran's oil minister was quoted saying yesterday, a day after Iranian President Hassan Rouhani called for increased trade between the two countries. The focus of the understanding is the development of the Naft Shahr and Khorramshahr oilfields, Oil Minister Bijan Zanganeh said according to a report on Iran's oil ministry website yesterday, without giving any details of the plan. Rouhani called on Saturday for Iran and Iraq to expand their gas, electricity and oil dealings and boost bilateral trade to $20bn, state TV reported, despite difficulties caused by US sanctions against Tehran. 'We hope that our plans to expand trade volume to $20bn will be realised within the next few months or years, Rouhani said, after a meeting with visiting Iraqi Prime Minister Adel Abdul Mahdi, in remarks carried by state television. Zanganeh had in February criticised Iraq for not agreeing to develop shared oilfields because of sanctions fears, according to comments published by the oil ministry's news site SHANA. However the energy industries in the two countries have close links and Iraq relies heavily on Iranian gas to feed its power stations. Iraq imports roughly 1.5bn standard cubic feet of gas per day from Iran via pipelines in the south and east of the country. 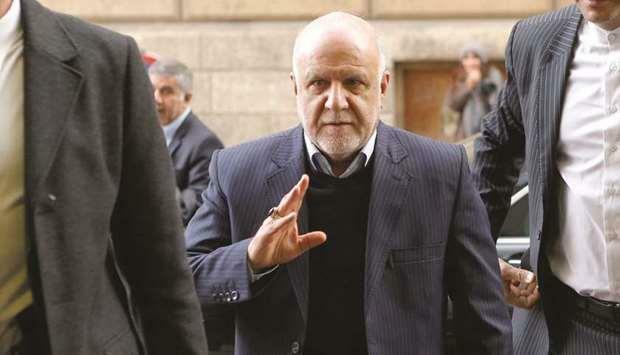 Zanganeh noted Iraq owes Iran approximately $1bn for gas supplied in the past. 'Given the lack of development in the petrochemicals and gas industries in Iraq, there is a bright perspective for cooperation between the two countries, Zanganeh said, again without giving any further details. There was no immediate comment from the Iraqi oil ministry yesterday about the oilfields understanding. After a trip to Iraq last month by Rouhani and Zanganeh, Iran had agreed to help Iraq with technical and engineering services in the oil sector. Iran also agreed to help with the development of mutual fields, rebuilding old refineries, and helping build a network for gas delivery, Amir Hossein Zamaninia, Iran's deputy oil minister for trade and international affairs, said yesterday, according to SHANA, the new site of the Iranian oil ministry. US President Donald Trump reimposed sanctions on Iran's energy exports in November, citing its nuclear programme and meddling in the Middle East, but has granted waivers to several buyers to meet consumer energy needs. In March the US granted Iraq a 90-day waiver exempting it from sanctions on buying energy from Iran. Rouhani earlier expressed hope that work on building a railway linking the two countries, would begin within the next few months. The railway project was part of deals reached during Rouhani's March visit to Baghdad, meant to underline that Tehran still plays a dominant role in Iraq despite US efforts to isolate Iran.